Marc Edwards - Phillips Murrah P.C. Directors from Phillips Murrah present our Blocks for Bucks donation to Thunder Cares. Just before tip-off at tonight’s Oklahoma City Thunder game against the Houston Rockets, Phillips Murrah Directors G. Calvin Sharpe, Nikki Edwards and Marc Edwards will participate in the check presentation ceremony at mid-court. The amount is for $20,600, which reflects the amount our Firm has donated thus far in the 2018-2019 regular season, prior to tonight’s action. For the final tally, blocks from tonight’s game will be added to the final amount, which will go directly to the Thunder Cares Foundation. “Our Firm likes being involved in the Oklahoma City community, and The Thunder Cares Foundation is a great way for us to do that,” said G. Calvin, whose litigation practice focuses mainly on matters involving medical malpractice, products liability and insurance. “We are huge Thunder fans and take great pride in partnering with Thunder Cares and all they do in the community,” said Marc, who represents both private business and public entities in a broad range of litigation with an emphasis on public utility, public pension, governmental and administrative laws. This is the second year that Phillips Murrah has partnered with the OKC Thunder with the Blocks for Bucks campaign. The check presentation from the 2017-2018 season can be seen here. What is Blocks for Bucks? Russell Westbrook on @okcthunder Instagram with Phillips Murrah logo. Attorneys and staff at Phillips Murrah are huge Thunder fans, and to recognize our home team’s accomplishments in blocking shots, the Firm is donating $100 to Thunder Cares for each blocked shot that the Thunder forces at home games during the regular season. 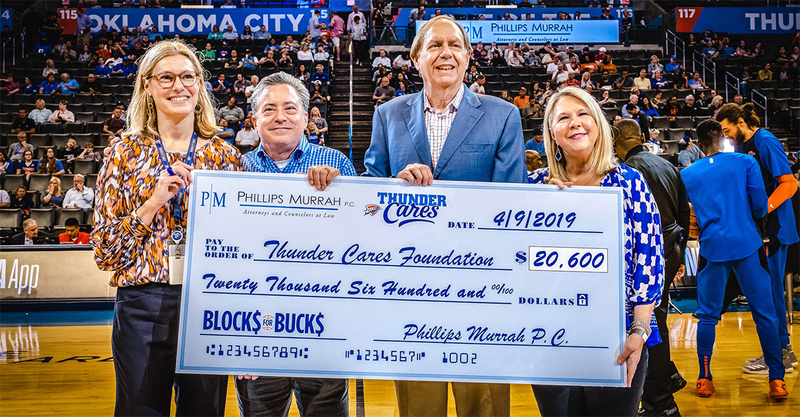 Blocks for Bucks began in November of 2017, when Phillips Murrah initiated our partnership with the Thunder organization. Helping to improve the community is at the heart of of our Firm’s mission, and the prospect of achieving that through the Thunder Cares Foundation with such an exciting and entertaining campaign was irresistible. As the Thunder team racked up blocks throughout the season, video highlights were posted at the Blocks for Bucks page on the Thunder’s website, along with a blocks counter and a running donation amount tally. Phillips Murrah looks forward to continuing to partner with the Oklahoma City Thunder and The Thunder Cares Foundation in the years to come. https://i2.wp.com/phillipsmurrah.com/wp-content/uploads/2018/10/Westbrook-w-PM-logo-012918.jpg?fit=634%2C740&ssl=1 740 634 Dave Rhea https://phillipsmurrah.com/wp-content/uploads/2014/11/pmlogo-web-logo-300x61.png Dave Rhea2019-04-09 15:27:102019-04-16 15:19:22Blocks for Bucks: End-of-season check presentation to Thunder Cares for over $20,000! Adults from left: Campaign Co-chair Todd Lechtenberger; Positive Tomorrows President Susan Agel; lead campaign donor Nissa Richison, campaign Co-Chair Judy Love; current Chair-elect Nikki Jones Edwards; David Barry, program alum/current volunteer, along with two current students. 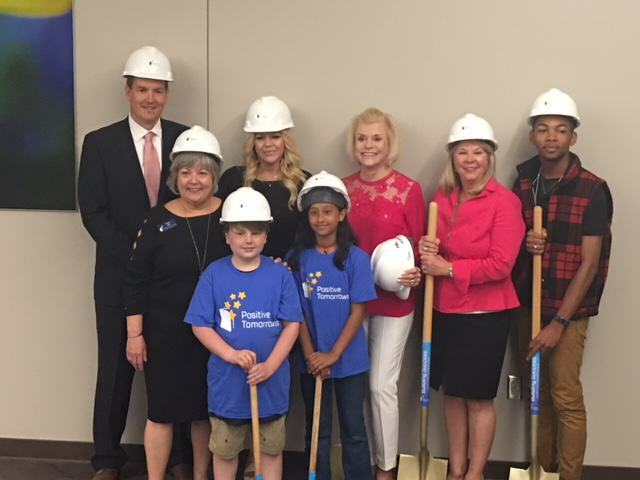 Director Nikki Jones Edwards and Phillips Murrah law firm are proud supporters of Positive Tomorrows and happily announce work is underway for the school’s newest facility. Positive Tomorrows is Oklahoma’s only elementary school and social service agency specifically serving homeless children and their families. The school broke ground on a new facility on June 12 and announced it met its Building Success Campaign goal of $10.2 million raised from the community. They raised an additional $5 million in new market tax credits, bringing the final project total to $15 million. The new facility will be over 30,000 sq. ft., more than double the school’s capacity, and will have space to serve students ages birth through 8th grade. It will be located at 901. N. Villa and include a gymnasium, open commons area, library, spaces for art and music, a special education classroom and a storm shelter. Positive Tomorrows plans to move into the facility and begin school in Fall of 2019. Edwards currently serves as Chair-elect and will assume her role as Chairman of the Board on July 1. 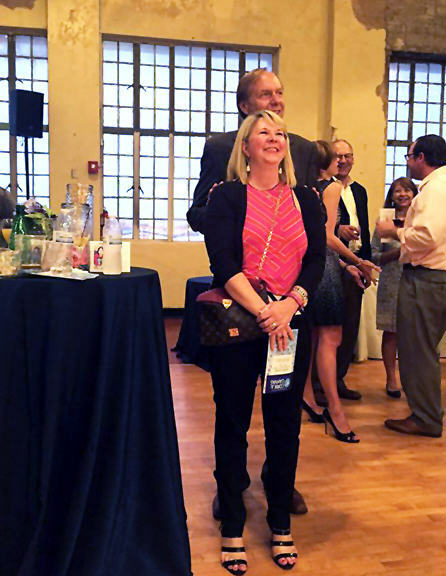 She, with her husband Director Marc Edwards, has been an avid supporter and involved in different capacities with Positive Tomorrows for more than 20 years. For more information about Positive Tomorrows, visit www.positivetomorrows.org. 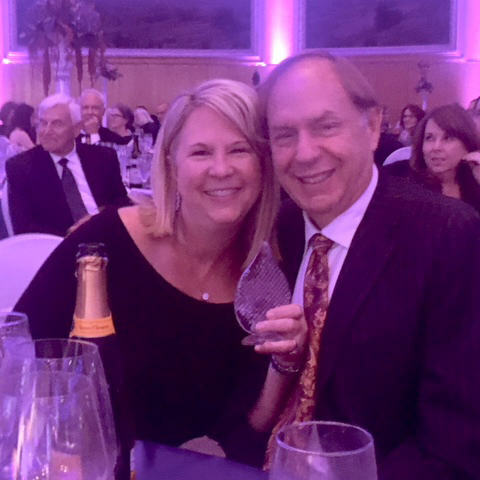 Phillips Murrah Director, Nikki Jones Edwards, who heads up the Firm’s Family Law Practice Group, was honored Thursday, October 26, at The Journal Record’s “Woman of the Year – 50 Making A Difference” awards gala. The event, and accompanying morning forum and post-event magazine, highlights prominent female business and community leaders in Oklahoma. The honorees, selected among hundreds of nominations from across the state, are recognized for their professional and personal contributions in Oklahoma communities. This year, which marks the 37th year of the Woman of the Year gala, featured keynote speaker Shannon Miller, Olympian gold medalist and health and fitness entrepreneur. It was Nikki’s first time to be honored as a part of the Woman of the Year event. 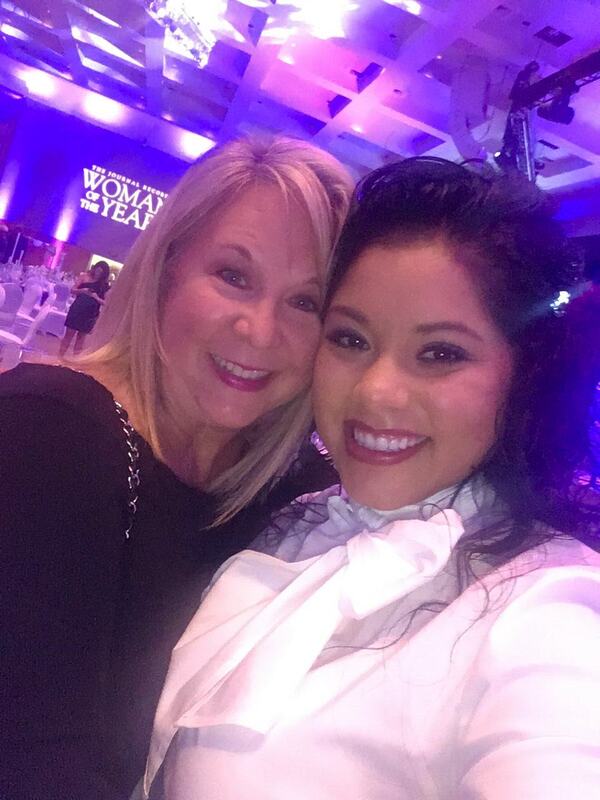 “The ‘Making a Difference’ list not only displays the important professional work of Oklahoma women, but also the personal investments they are making to positively impact every sector of our state,” she said. Nikki is involved in numerous Oklahoma community service and philanthropic projects, including Leadership OKC’s Signature Program Class 36, which educates civic-minded business people on how to develop greater capacities for local leadership. She is also a board member of both Positive Tomorrows, an educational non-profit developing programs for homeless children and their families to stop the cycles of poverty, and the Oklahoma Single Parent Scholarship program, which awards scholarships to low-income single parents to help them achieve self-sufficiency through post-secondary education. Nikki also helped pioneer a program to develop the next generation of law and leadership in Oklahoma. A founding advisory board member for the University of Oklahoma, Women and Gender Studies program, Nikki routinely guest lectures on important topics such as women in leadership programs, women in law, gender equality in the legal field and family law. Accordingly, Nikki was honored with the Journal Record’s “Leadership in Law” award in both 2008 and 2017. Nikki endeavors to have a lasting influence on the future leaders of Oklahoma through positive mentorships in her professional and personal life. Phillips Murrah is proud to sponsor The Woman of the Year endeavors, and we congratulate Nikki, and all of this year’s honorees. Thank you for all you do to make Oklahoma the best place to live and work. Phillips Murrah is proud to announce that 37 of our attorneys have been named to The Best Lawyers in America© 2018 list in Oklahoma City. Phillips Murrah Directors Marc and Nicholle Jones Edwards. Phillips Murrah sponsored Positive Tomorrows’ annual Cork & Canvas on Thursday, April 2 at the Oklahoma City Farmers’ Public Market. Positive Tomorrows is Oklahoma’s only elementary school specifically serving homeless children and their families and prides itself on educating at-risk children by dedicating attention to their unique educational and social service needs. The event includes an evening of food, drinks, silent and live auctions featuring art by Positive Tomorrows’ students, and live entertainment, and typically attracts more than 500 philanthropic leaders from the community. Learn more about Positive Tomorrows here. Marc Edwards is a litigation attorney and Chair of the Government Relations and Compliance Practice Group. He represents both private business and public entities in a broad range of litigation with an emphasis on public utility, public pension, governmental and administrative laws. Marc Edwards, a director at Phillips McFall McCaffrey McVay & Murrah, practices administrative law, governmental relations and civil litigation. After receiving his law degree from the University of Tulsa in 1983, Edwards began his legal career as an assistant attorney general with the Oklahoma attorney general’s office. He entered private practice in 1987 with Watson & McKenzie before joining his current law firm the following year. Edwards is a member of the Oklahoma Bar Association, American Bar Association and the National Association of Public Pension Attorneys. For the past 14 years, he has represented Oklahoma Firefighters Pension and Retirement System, the pension system for all firefighters in the state. Edwards’ community involvement includes serving on the boards of the Stavros Foundation, Oklahoma Property & Casualty Board and Oklahoma Long Term Care Administration. In addition, he is president of the Lynn Institute and past president of the Dale Rogers Training Center, which provides employment opportunities for individuals with disabilities. He considers his involvement with the Dale Rogers Training Center his most significant public service accomplishment. During his service, Dale Rogers has experienced tremendous growth as a nonprofit agency, in terms of budget, capital expansion and services.